Form Fonts has security measures in place to protect the loss, misuse and alteration of the information under our control. All data is protected using the most advanced methods available. We do not store financial information such as credit card numbers or personal information such as social security numbers on this site. For all credit card transactions, Form Fonts uses a secure server with 128-bit SSL encryption. SSL encryption ensures that your information is sent securely and directly to us. If you see a security alert such as the one shown below, the alert is identifying our site as a new to you and questions if you'd like to proceed. 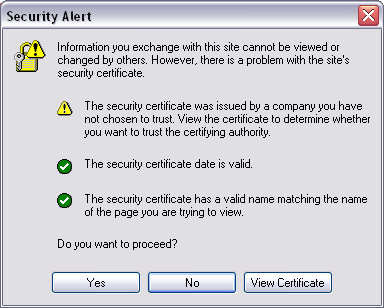 Many sites are pre-entered into web browsers as trusted. As such, all servers that are not in this list are considered un-trusted and thus is the meaning of the message. We assure you that our server is very secure and safe, so click the "Yes" button to accept our site's secure certificate and begin the subscription process.